An incredibly disturbing new trend is threatening Asian elephants; the elephant skin trade. A recent report published by Elephant Family and presented at the Asian Elephant Specialist Group conference in Bangkok in April 2018, detailed the source, supply-chain, traders, marketing, recent trends, and end consumers of this growing, illicit trade. In the past, Elemotion Foundation has noted the use of elephant skin by hill tribes as a mystic remedy for infertility and has occasionally seen elephant skin and tail pieces for sale. However, this report by Elephant Family shows the trade is quickly becoming much larger and much more sinister. The investigation revealed the skin source is mostly coming from wild elephants poached in Myanmar. Laos is also a possible source. End consumers are Chinese. Powdered skin and dried skin pieces are being sold on an almost industrial basis as a remedy for stomach ailments. The report also detailed a disturbing new fad spreading across Chinese social media for elephant skin beads as an ornament or fashion accessory. One elephant bead trader claimed to have imported 400kg of skin in 2015 to make quality beads. Trade in elephant skin is mostly prohibited in China. However, traders use online and social media forums such as WeChat to find customers. Physical trade of elephant skin and its derivatives was found by Elephant Family in markets in the gambling town of Mong La, Myanmar; the Chinese province of Xishuangbanna; Guangzhou city, Hong Kong, and other places. The price of elephant skin products seems to be rising. The increase in sales of elephant skin and skin powder for medicinal purposes and the shift to using elephant skin as an ornament or ‘gemstone’ has been seen with other species, including rhino horns and pangolin scales. In both cases, these trend dynamics led to an increase in profits, and in turn, a dramatic rise in poaching. As you can imagine, the carcasses of these magnificent animals left skinned, mutilated, and dismembered is shocking, outrageous, and abhorrent. 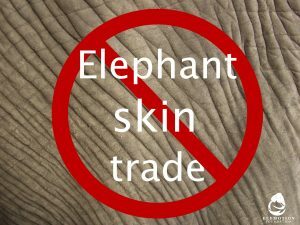 It seems that China is also allowing some legal production and sale by pharmaceutical companies of a product called ‘elephant skin powder’. Share this post. Read the report. Raise awareness about this growing trend. Educate yourself, friends, and family, especially those living in Asian elephant range countries. Write to your local Laos, Myanmar, and China embassies telling them you would like to see measures taken to address poaching and stop the illegal trade of elephant skin and its by-products. Sign a petition, or start one yourself. If you or anyone you know find these products, of course, don’t buy them. Tell the seller you believe endangered Asian elephants should not be killed for commercial profit. Elephant skin belongs on elephants!